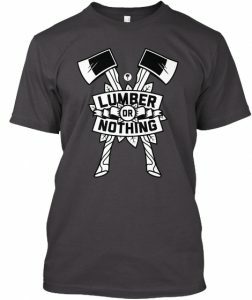 In an attempted to make the absolute most of my ridiculously small workspace, something I think most woodworking hobbyist can relate to, I have decided to break down my shop and start over. The decision was made quite suddenly after having to continuously navigate my cluttered workshop. A feat that often resulted in an irritated woodworker aka, me. 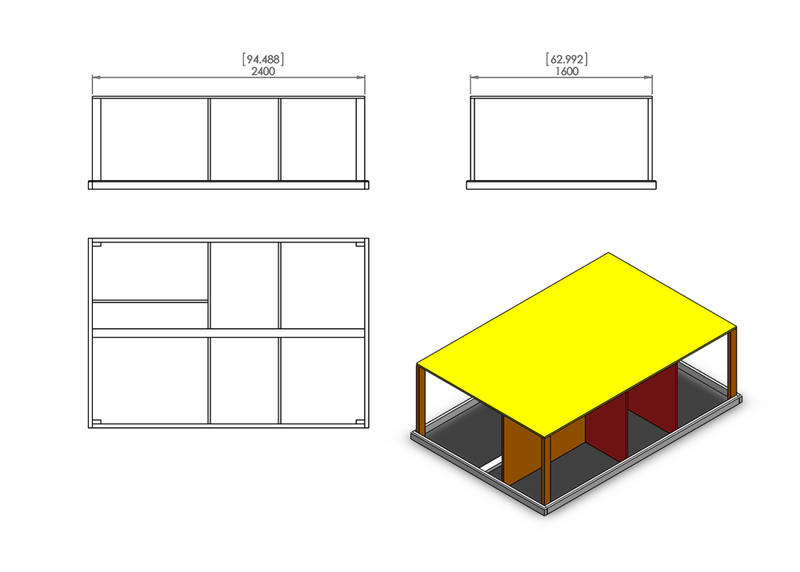 I figured that the only way I would be able to once and for all optimize my <3x6m (10x20ft) space was by building one workbench that could accommodate all of my most used equipment. In addition to all the equipment, I wanted to add centralized power distribution to get rid of all the extension cords. I also wanted the bench on wheels so it could be moved around but most of all, I wanted easy access to everything. On paper, the idea seemed solid but actually achieving it would take a good amount of planning. An obstacle such as installing my miter and table saw without them clashing would be one of many that needed to be overcome. After about six revisions of the original, I finally reached a design I would be confident in building and the proses of creating my ultimate ALL-IN-ONE Woodworking Workstation began. 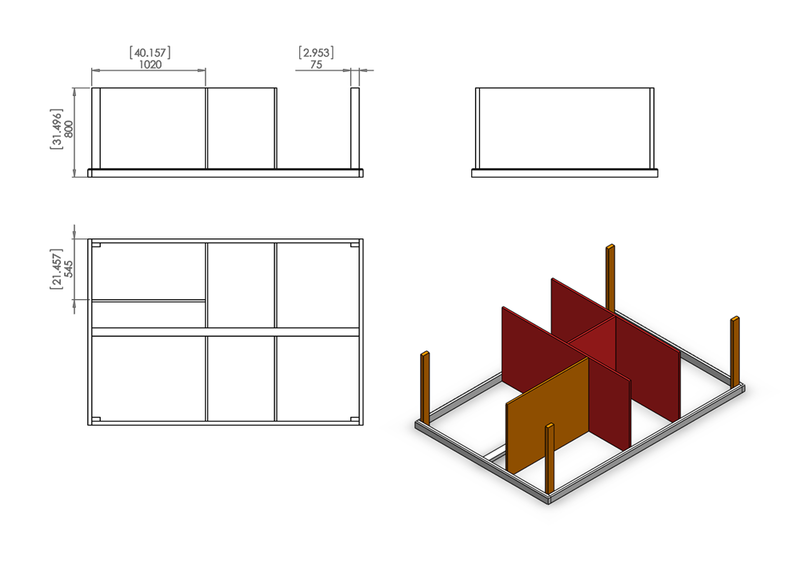 Over a series of installments, I will share the process I followed in building my workstation and sharing the dimensions of each stage for reference purposes. Note that many of the dimensions are subject to the corresponding equipment and these would need to be adjusted to suit different makes and models. 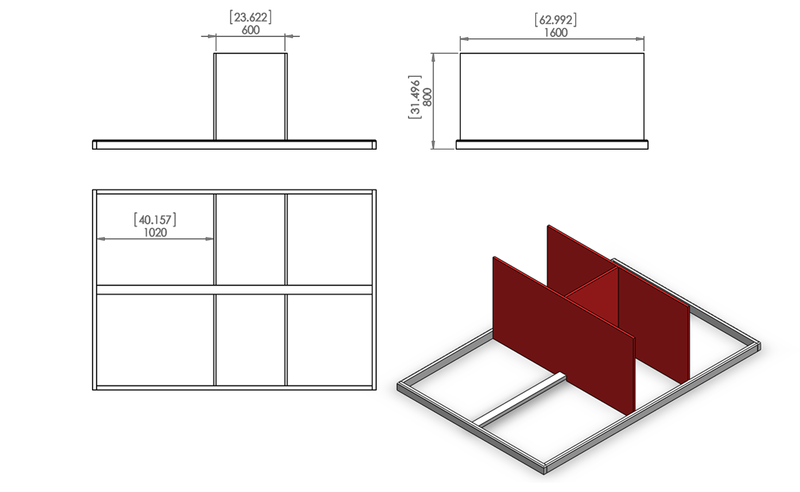 Bench partitioning – Top view. The instructions that follow are intended to be considered along with the visual instruction provided by the video above. Before I could start adding equipment to my woodworking station I needed to get the basic framework up and on wheels. 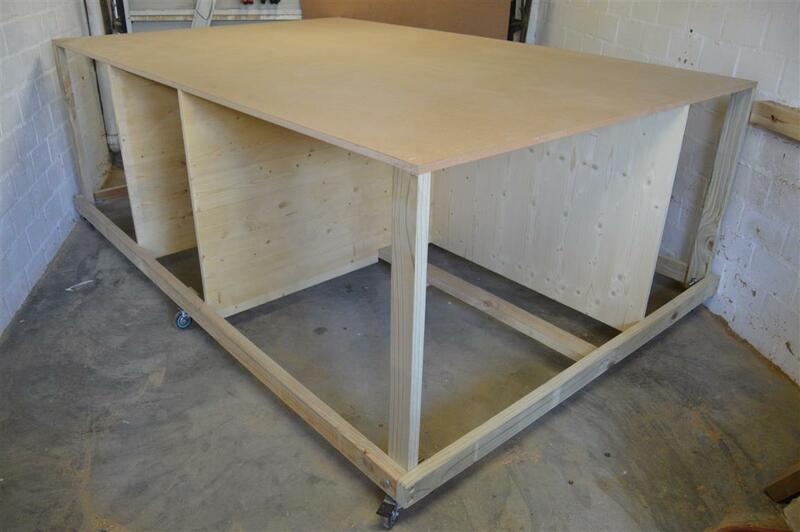 This would consist of a base frame, some partitioning, and the bench top. The assembly of which will be described in this post. The base frame was assembled using 75x35mm (1.378×2.953“) construction pine that was run through the planer for a better finish and assembled using m8 (5/16“) coach screws that were sunk into the wood. The base was to be my reference point for the rest of the stage 1 assembly and therefore enjoyed special attention in ensuring it was assembled correctly. The center brace was installed at a 20mm (3/4“) dept that was equal to the thickness of the plywood I was using. Some of the base panels would later be installed on top of it allowing it to sit flush with the top of the base frame. The crossectional support will be added by the paneling installed in the next step. Besides being the central support for the bench top, the paneling installed in this step would also give more cross-sectional support to the base. In addition to this, it created the cubicles that would accommodate the thicknesser on one side and the miter saw on the other. The miter saw and thicknesser will later be installed to fold away into these cubicles when they are an obstruction to the table saw. The two larger panels had small cutouts made in the center at the bottom allowing them to slot over the base center brace and attached from the bottom in addition to being attached to the sides. The mid panel, however, was cut slightly shorter allowing it to sit flush with the top of the other two while being placed on top of the center base brace. The last step before the bench top would be installed was adding the four corner post along with one last piece of paneling. The post was installed using the same lumber as the base frame to support the corners of the top while the paneling would be the divider between the compressor and the table saw that would be installed in the next stage (PART 2). Before continuing to the next step I installed eight heavy duty casters (50kg/110lbs each) to handle the load of the bench when all the planned equipment would be installed. Four of which had brakes. I installed these at this stage while the bench was still light enough to tip on its side. The wheels were spaced to distribute the load evenly with the four breaking casters installed under the corner post allowing accessibility. Because the center brace does not sit flush with the bottom of the base frame a spacer needed to be installed between the brace and the caster. 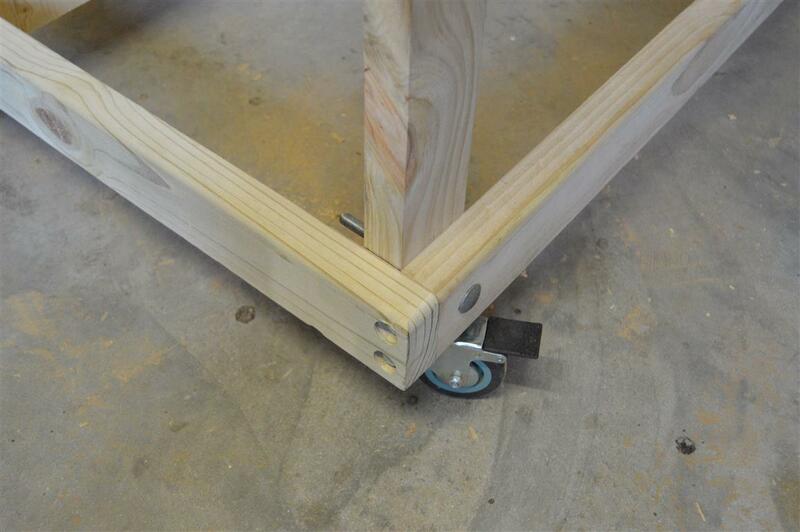 As for the side casters installed in the center, a spacer was installed on the inside of the frame to support the entire caster base plate as this plate was wider than the lumber used to assemble the frame. Stage 1 of the ALL-IN-ONE woodworking workstation would be concluded by fixing the top to the already assembled skeleton of the bench. I used an 18mm MDF board for the top of the bench. Doing this had a number of advantages. The smooth surface of MDF would create very little friction when moving pieces of wood over it. This would be especially useful when the table saw and thicknesser is installed. 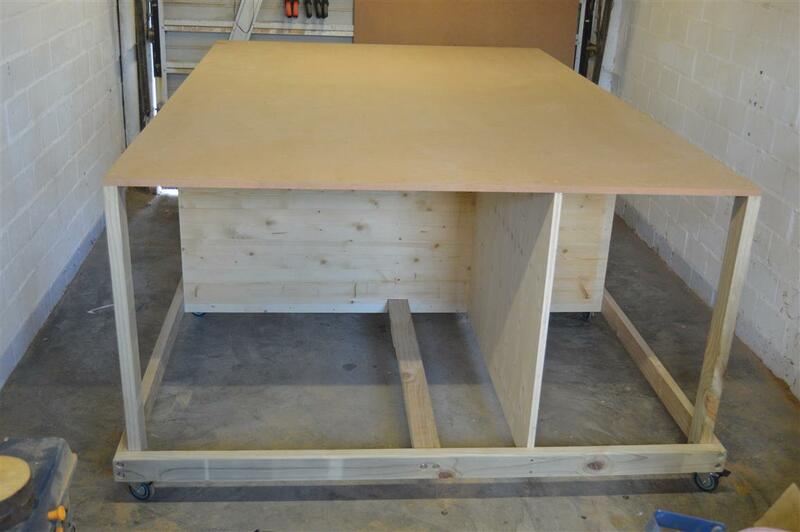 18mm MDF is strong and would allow me to use a single seamless sheet for the top. MDF is easy to work with as it cuts and machines easily without much wear on your equipment. The bench top is fixed from the top to the corner post and the paneling using screws that are countersunk into the top. This will prevent the screws from scratching or damaging any stock that gets moved over the top of the bench which is, again, especially important when using the table saw and thickness planer. where can i find the downloadable plans for part two and part three of the work bench with the table saw and drop down miter saw. Unfortunately there has been a bit of a delay in the availability of the plans. The plans should start going up on the site later this week. They will, however, not be downloadable and only be avaliable on the site. Great work! I have enjoyed checking out all of your projects. You have some very well thought out designs and provide excellent detailed instructions. I first saw you on YouTube and came over. great woerk body. ı follow you on youtube . Great work mate! I’m just looking for the right table for my new space (is 3x6m as your’s) and I thinks your design is AMAZING! Just what I was trying to desing, but better, hahahaha. May I ask you about the MDF sheet on the top? You said is a 2400×1600 but… is in one piece, right? The usual ones I can find are 2440×1220 ;( Could you give me a bit more info about it? How have you decided on that measure? A full sheet of MDF is 2750×1830 where I’m from (South Africa) though we have 2440×1220 also. The overall dimensions of the bench were the result of all the equipment I wanted to accommodate on it while keeping it small enough to use comfortably in the small space I have available. The bench was redesigned a number of times before I was comfortable enough to start building it. If you need any additional info feel free to ask. The other parts of the build should start going up later this week. You should sell the plans. You’ve done the work, make a little make more money by selling the plans. I’d love to start with plans like this and then customize it to my tools and build. To be honest, I have no desire to make money from the plans. All these projects are things a thought up and if people find value in them and use them, well, that gives me a lot of gratification.  I am considering making other products (like t-shirts) available for purchase if people feel that they would like to support the site. This is a little bit down the line still, however. You are the man, I love the design and plan on doing one myself. Great job, and thanks. Glad to hear you like the project. It has definitely made my life a lot easier in the shop. Though I am a big Makita fan I would advise against swopping the DW745 for the MLT100. Personally, I find the Dewalt to be a better saw. I am currently working on a fence upgrade for my saw to attach it on the opposite end also. Jean, first off thanks for this amazing bench. By far, it is the best use of space I have come across. I just had a quick question about measurements on this. I also I am in a one car garage and want to use these plans. On the frame, it shows the dimensions as 2400 x 1670. Then the MDF shows dimension of 2400×1600. Are the 2 of these supposed to match up completely? The outside diameter of the base frame is 2470×1670. 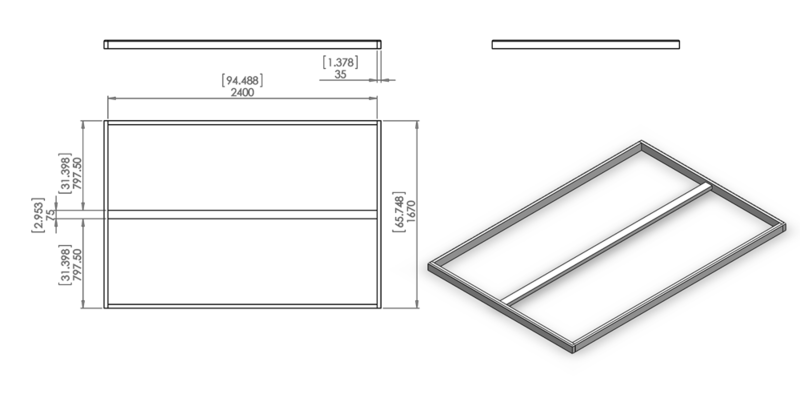 If you look at the top view diagram in “step 1” you will notice that the length indicated on the drawing is only for the piece of wood and not the entire frame length. On the front view diagram above it, I indicated the lumber thickness at 35 giving you a total frame length of 2470. I hope this makes sense and apologize if the drawing is confusing. I’ll look into updating it. 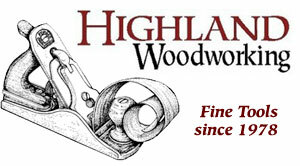 Jean, I have just finished watching all the videos for the workbench, drill bit cabinet etc & they are great. You make it all look easy & you have the mind of a genius. Some of your little tweaks are awesome. I have most of the tools you have but not even a quarter of the skill. Keep up the good work and great videos. By the way I love the dog. Thanks for the support, Paul. Happy to hear you like the content. Haha, yeah, my boy is awesome. I am sorry to ask you this question? (First of all I am building this awesome table!). What are the dimensions in: I know some are in mm and inches. The numbers with brackets around them and numbers under brackets. Thank you for a great table plan!!!! Michael from Tennessee. The units in brackets are inches in thousands. The other units are metric. Remember to keep in mind that many measurements will change when the design is adapted to suit different types and makes of equipment. What a wonderful and useful project. Thank you so much. Also, is there a complete set of construction plans yet? A materials list would be most welcome and help us get an accurate and fast start. Can you help with these two items? Ps: Be most pleased to pay you for these two items. Unfortunately, I don’t. I didn’t see the point in making the exact sizes of everything available because many dimensions would change as the bench gets adapted for other equipment. The bench was designed, built, and sized to fit my equipment but I can’t guarantee that it would fit different makes and models. I tried to make as much information as possible available to readers for inspiration and so allowing them to adapt the idea to whatever equipment they have in their shops. You are more than welcome to ask any questions regarding the project and I will do my best to help. Jean- I just left a comment after watching Part 5, then I returned here to look at the whole project again. When I saw the casters (which I wasn’t remembering during Part 5) I realized why the compressor sits on that shelf. Still, I wonder whether the compressor’s vibration shakes the cabinet enough to create problems if it suddenly comes on while performing another operation? Also, do you have any thoughts about doing a project like this using a solid core door (36″ x 80″) for the top? Again, this concept is a fabulous idea & I really appreciate the thought & work you’ve put into it. I started building my station from my original design as a prototype with the idea of refining the flaws after a period of use. Luckily, so far there aren’t many (with the exception of the compressor installation). Because it was a prototype I tried to do it as cost effective as possible. In a perfect world, I would build it with a solid wood top and frame and only use engineered woods for paneling. Hey Jean, I have just a few questions about your all in one bench. I have recently started woodworking so I’m still trying to figure things out. Do you have digital plans & also I have cerebral palsy & when I’m working I need to sit. Can I lower the bench & have it still function with the miter saw & planner tops? Thank you & I really enjoy your channel. I have digital plans but they aren’t complete yet. Unfortunately, the height of the bench is required to have the necessary room available to fold down the miter saw. If you could make the bench wider you could probably adapt the design so that the miter saw flips as the planer does. In which case you will need a bit less height to store the tool. I can’t say for sure if it would actually work without designing and building it myself. Thank you for the reply, that was very helpful. I have a few ideas in mind. I was also wondering how you did your power supply to the work bench for each tool. Is there a video showing how you did that? Thank you again your knowledge & skill is amazing to watch, can’t wait to see what you do next. No problem, it’s a pleasure. I haven’t added the entire power distribution. I will be doing that in my last video on the bench. Right after I have installed the router table. Hopefully very soon. Perfect, I will be watching for that one as well. I also have a bench top router table I need to install. Unfortunately, I haven’t been able to get around to adding a central power layout but my intention to do so still very much exists. Now I only have a 25A 220VAC supply available to me that would be hard pressed to run all the tools on the bench at once. Especially if they all startup together. This would never happen because I can only work on one at a time but these are the technical power requirements of the bench. When I add a power layout I would consider some method of interlocking supplies to each tool so that no more than one of the bigger machines can be powered at a time (along with the dust collector of course). Great work, mate! You said is a 2400×1600 sheet, but… I only can find 2440×1220 MDF sheets ;( There is any problema with taht? If I split the top sheet (ex: 2 sheets of 2400×800 each) the bench will continue stable? Could you give me a bit more info about it? Thank you very much mate!! Unfortunately, without building it myself I can’t really say how stable it would be but I’m sure you could make it work just fine. There have been one or two people that have contacted me with a similar dilemma and seem to have made it work. I would, however, consider putting the seam between the two panels slightly off-center. For example, have one 2400×1000 and the other 2400×600. Let me know if you figure it out or have any more questions. Would you be able to give a rough estimate of the cost of wood for this project? I’m in the US but i’m not sure how much of a difference that makes. I responded to your question on my YouTube channel so I’m just going to add that reply here also. Excellent…!!! I’ve been researching YouTube and the internet for the past 6-7 months for ideas constructing a mobile consolidated work bench. Reason being, I’m in the military and relocate every 3-4 years. When I came across your build I basically went through *Part 1-8* the same day. Great job, great detailed explanation of functionality and design. This is exactly the idea I was looking for. I was about to head to the drawing board, but your build was exactly what I was looking for. With a few tweaks it’ll be awesome. Love your channel, like your advise and look forward to every video you put out. Have a good one mate, cheers…!!! Very pleased to hear you found value in the concept. Best of luck building your own. My workshop/garage is similar to yours i think. How big is it? And, are you satesfied with the sice? I would love a bigger shop but with the bench, I manage quite well in the small space. Exept for the temperature (im using a heatcanon at this moment), were quite even. I mist thank you for puting the plans out on your site. Thats amazing. We start the build tomorrow so i cant wait to get the shop organized. I love this design and am using it as the foundation for my workshop table. After having worked with it for a while, do you ever feel like you should have doubled up the top surface? Looks like you are using 3/4″ MDF – I will be using 3/4″ blondewood single finished side plywood sheets – wondering if I should double up the top. If it is an option I would say go for it. When I built mine I didn’t have the funds for anything more than the MDF top. Great build. Just started watching yesterday so half way through. Couple of questions? Any reason why you didn’t put the Miter saw on a flip like the planer? How is the MDF top holding up? The miter saw was too long (back to front) to be accommodated in the bench when installing on a rotating bed. Also, I didn’t want to store the saw upside down. You mentioned “m8 (5/16“) coach screws”. How long are these? I’m a beginner and wondering if there is a length ratio to go by when creating a base like this. In the U.S., a 2″x4″ would actually measure 1.5″x3.5″. So the screw would need to be long enough to go through 1.5″ of the first piece of wood and then how far does it need to go into the other piece? I would guess a minimum of 1.5″ into the other piece of wood making the total screw length equal 3″… or a 2:1 ratio of screw length to initial board width. A 4.5″ screw would be a 3:1 ratio. Is this even a “thing”? Or is it “longer” equals “stronger”? That’s a good question and one I am personally not sure of either. I am not aware of a set ratio. I normally play it by ear because different wood densities have different requirements when screwing. That’s why I like to have a variety of screw lengths at my disposal when assembling a project such as this. With coach screws a person is able to apply quite a bit of torque which means it can strip out the wood when working with a softer stock. In this case you would want to use a longer screw. In the case of hard stock, however, I’ve found that if the screw is too long you run the risk of splitting the wood. This is a definit must-build for me. Being from South Africa myself, I’ve been looking for ways to build a sturdy and robust work bench that can house all of my tools. I was looking at videos from other woodworking channels, and next moment your channel pops up. Luckily for me, I’ve got a double garage at my house, so space for me is not an issue. And thanks for taking the time to come comment on the site. Really impressed with this. I’ve been looking at different plans and designs to build a new work bench as my shop has grown and I consistently have to put my tools away which takes up so much time. I’m planning on using your design but going to put my own spin on it. Thanks for sharing your work. Looking forward to more designs by you. Great to hear. I hoped people would use my bench for inspiration to design their own benches specific to their needs. Thanks for the comment and best of luck. I have been slowly getting into woodworking as I grow older. With a table saw, Miter saw, router, Jointer/Planer, other various bench tools, and now a Shapeoko 3 CNC, I find myself running out of room in my garage, just as you have. I started designing a table to flip tools and provide a work surface, then decided to have a gander online. I ran across your site and videos, and what you have designed, is just the absolute best solution. Your concept is just short of genius. Thank you so much for taking the time to share this work with all of us. Very happy to hear you found value in the bench design. I’m so glad I found this. 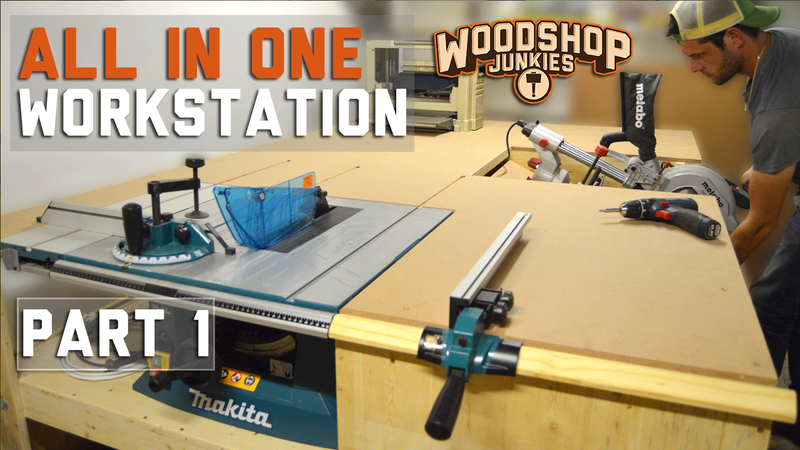 This workbench is brilliant!! I love the fact that you can add to it as you go along. Plus all I’ll have to do is adjust for the openings to fit my tools. I’m excited to start working on this project, as I too have limited space in my shop, and I’m finding myself becoming more and more frustrated as I work. Jean, great work and thanks for sharing your design! My “shop” starts getting an upgrade this week As I’m tired of tripping over cords and weaving through and around half a dozen machines, moving things around to make room to work. Been researching workbench designs for a bit, your vid’s are excellent, great mix of details and comedy relief to keep your audience entertained while learning. Time to make some sawdust! Thanks for getting in touch. Great to hear you enjoy the videos. Good luck with your shop upgrade. Like many others who’ve posted here, I have been searching for that “perfect workbench”, and found your design to be both aesthetically pleasing. and extremely functional – with the exception of the compressor. I think I have a solution for that if/when I finally find the time to attempt a similar build. Would a foam rubber matting underneath a wooden base with a lip (the lip would halt the compressor from skating) dampen the vibration? I agree. The compressor was a swing and a miss so I have recently decided to remove the compressor from the bench. Some sort of insulation between the compressor and the base would definitely go a long way in dampening sound. Great table! I see one slight problem with the Mitre saw. Looks like you will have a problem with the 45 degree cuts! Can’t wait to see your next video. I also stay in SA, Centurion.